Forest wildfires are a main environmental hazard in many parts of the world. In Mediterranean-climate areas, climate conditions and vegetation features are responsible for a high wildfire hazard, mainly during the long summer drought. In Catalonia, changes in land use, with abandonment of crops and grasslands, permit the expansion of continuous woody vegetation cover. This, along with the high number of human activities that can initiate fires in or near forest areas, increase fire hazard. The possibility of a climatic change can make things worse. For that reason, it is essential to increase our understanding of the phenomenon and our capacity to predict short and long term changes in order to consider alternative management strategies. The use of fire is nearly as old as the human race. Fire was the earliest tool by which humans not only modified, but deliberately managed ecosystems for their own particular ends. One of the principal uses of fire has been, and still is, to regulate the amount of biomass that can be directly used as forage for domestic or game animals. Periodic burning of the ‘natural’ vegetation is a long-established practice in many parts of the world, particularly in the tropical grasslands, and in heaths and moorlands in Britain. The aim in both areas is the same: to clear plant litter and reduce the proportion of less nutritious woody and fibrous tissues and increase that of the more nutritious and palatable young green foliage. The effect of regular and controlled burning is to give a competitive advantage to more fire-resistant species, i.e. the pyrophytes. Among these are plants whose seeds have hard protective seed coats. Some seeds will only open and germinate after a fire, either because the high temperatures produced are necessary to crack the seeds or seed-containers, such as cones, or because the fire leaves a warm seedbed which promotes rapid germination temporarily free of competition. Some plants have fire-resistant foliage and/or bark. Others have underground stems or root stocks which carry over-wintering buds whose growth is stimulated by the removal of the above ground parts of the plant. In contrast, other species—particularly trees and shrubs — are very vulnerable to destruction because of the volume of inflammable woody material, and unprotected seedlings. One of the most important consequences of fire has been to produce and to maintain types of ecosystems which would not otherwise have existed. An outstanding example is that of heaths and moorlands in Europe and more particularly in Britain. The dominant component is a woody shrub, heather (Calluna vulgaris). It has a wide range of tolerance of climate and soil. Under natural conditions it can grow to a maximum altitude of about 500— 600 m, depending on environmental conditions. Originally, it was probably a widespread but minor element of forest and woodland on acid soils. However, it is unlikely that it would have dominated many areas other than those where exposure or extreme soil conditions inhibited tree growth. The spread of heather-dominated areas started early with the clearance of forests and was further aided by the increase in number of domestic grazing animals (particularly cattle and sheep) which very effectively prevented the regeneration of tree seedlings. Heather, and many of its associated species, is a particularly valuable evergreen forage plant. It is the staple diet of the red grouse and one of the major food sources of the hardier breeds of hill sheep (e.g. the Scottish Blackface). For at least 200 years in Highland Scotland, and probably longer elsewhere, burning has been the main means of maintaining heather as one of the dominant forage plants of rough grazing in Britain. The object of burning is to keep as much of the heather as possible at its most productive stage; that is, when the proportion of edible green shoots is at its highest. Repeated burning tends eventually to produce a virtual monoculture of heather. In areas where grazing and burning have been discontinued, heather moorland can eventually be colonised by trees. Two main types of vegetation are widespread in the Park. Of these the maquis is undoubtedly a type of sclerophyllous (evergreen, leathery and spiny leaves) vegetation. It is dominated by shrubs and, although these vary very much in height and species from place to place, they are predominantly of the same life-form: although some are near-leafless, spiny plants, the great majority are evergreens with leathery, drought-resistant foliage. Species like the wild olive (Olea europaea), the carob (Ceratonia siliqua), the lentisk (Pistacia lenti.scus), the Kermes oak (Quercus coccfera), the cistus (Cistus spp.) and the arbutus (Arbutus unedo) are typically sclerophyllous, but they are often mixed with heathers (Erica spp. ), gorse (Ulex spp.) and broom (Genista spp.) which are of different life-forms. Many types of maquis have been recognised, often within the same general area, each being named after its dominant species. Garrigue also covers large areas in the Park, particularly on more pervious outcrops such as limestone. Although some species of typical maquis reappear in garrigue along with a number of really low-growing, prickly shrubs, typical garrigue communities are characterised by aromatic, herbaceous plants and should not therefore be classed as true sclerophyllous vegetation. Species of the deadnettle family (Labiatae) and thyme (Thymus spp.) are characteristic in many places. Though there is no doubt that much of this present-day maquis and garrigue occupies the territory of former forests, it is also certain that, over limited areas, these scrub communities are true climatic climax. This is probably true of areas where very pervious rocks and wind exposure give exceptionally dry habitats. 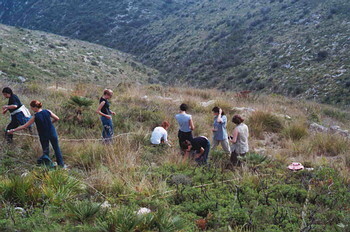 In the aftermath of the extensive 1994 fire, the Garraf Natural Park established an investigative programme centred on the dynamics of vegetation regeneration. It was based on the monitoring of fixed vegetation plots which were established according to two factors: the recurrence of forest fires (areas unaffected by fire since 1982 and those affected by the 1982 and 1994 fires) and the type of plant community. Monitoring of the plots began in 1996 and has continued with a regularity that is determined by the type of vegetation and the time transpired since the last fire. The preliminary results of the study show that the vegetation of the Garraf is, in general, recovering well from the 1994 fire, although qualitative changes (floristic or in plant communities) and quantitative changes have occurred which have modified the relative abundance of some species. The most important changes have been observed in areas of strawberry tree maquis with fragments of holm oak woodland, where the opening up of the woodland by fire has allowed species such as Quercus coccifera, Cistus sp. and Ampelodesinos inauritanica, more typical of communities in regression, to penetrate. In areas of garrigue, the holly oak has responded quickly and in barely two years the community has recovered its former aspect, although a certain floristic impoverishment has been detected. The slowest communities to recover have been the calcicole scrub and coastal maquis where the species that regenerate by germination have lost a large part of the importance they had before the fire. These communities seem to need between 10 and 15 years in order to resemble the areas not burnt since 1982. Nevertheless, the most important effect of the fire can be seen in the pine woodlands in which natural regeneration has only occurred in areas of pine woodland of over 20-25 years of age. The bud bank from underground structures in resprouting Mediterranean species is stimulated after disturbance. However, resprouting is controlled by abiotic (e.g. water and nutrient availability) and biotic factors (e.g. competition and herbivory). Water and nutrient availability stimulate resprouting, but competition with neighbours and herbivory affect resprouting negatively. Many Mediterranean species are able to resprout from underground organs after fire. This ability depends on the species, availability of post-fire resources, fire intensity, plant size and competition effects of neighbours. Fire may favour seedling establishment by stimulating seed germination or by releasing resources. Several laboratory experiments show that temperatures higher than 200 °C inhibit germination in most species. Lower temperatures may stimulate germination, and some species produce many seedlings after fire. A clear relationship between pre-fire vegetation cover and seedling density was not observed. After fire, seedling survival increases, probably because of the larger amount of available resources. Wildfires are one of the most important environmental problems in the Mediterranean Basin. The reduction of understorey biomass accumulation in Mediterranean forests is assumed to be a key factor to prevent wildfires. Domestic livestock grazing may be used as a tool to control understorey shrub development, thus preventing forest fires and ameliorating forest structure and production. Germination and growth of seed mixtures on denuded steep slopes have been studied with the purpose of decreasing erosion risk and to facilitate the subsequent colonisation by native plants. A fifty per cent ground cover is required to avoid erosion. The most successful species in terms of soil protection hinder the natural succession. Soil fertilisation with sewage sludge modifies the effectiveness of the herbs. Biological invasions mediated directly or indirectly by humans are threatening biodiversity around the globe. Plant invasions can be driven by inter-specific interactions with native species and by disturbances. 1. Which species respond most successfully to fire damage and why? 2. How does fire affect the relative abundance of species? 3. Does competition from neighbours affect resprouting? 4. Does slope angle affect the degree of resprouting or reseeding? 5. Does aspect affect the degree of resprouting or reseeding? 6. Does fire intensity affect the degree of resprouting or seeding? 7. How does fire affect soil nutrient content and structure? 8. Does fire damage favour certain species, and can these species encourage further fires? 9. Does fire disturbance result in higher species diversity? We subscribe to the Geographical Association Fieldwork Code of Practice. Barcelona Field Studies Centre S.L.